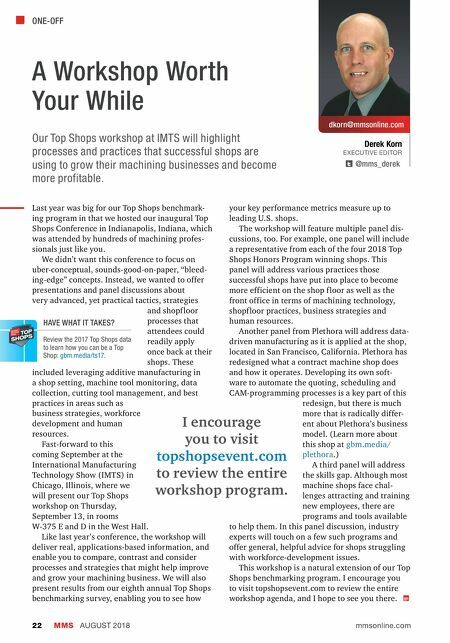 ONE-OFF MMS AUGUST 2018 22 mmsonline.com dkorn@mmsonline.com Derek Korn EXECUTIVE EDITOR @mms_derek A Workshop Worth Your While Our Top Shops workshop at IMTS will highlight processes and practices that successful shops are using to grow their machining businesses and become more profitable. Last year was big for our Top Shops benchmark- ing program in that we hosted our inaugural Top Shops Conference in Indianapolis, Indiana, which was attended by hundreds of machining profes- sionals just like you. We didn't want this conference to focus on uber-conceptual, sounds-good-on-paper, "bleed- ing-edge" concepts. Instead, we wanted to offer presentations and panel discussions about very advanced, yet practical tactics, strategies and shopf loor processes that attendees could readily apply once back at their shops. These included leveraging additive manufacturing in a shop setting, machine tool monitoring, data collection, cutting tool management, and best practices in areas such as business strategies, workforce development and human resources. 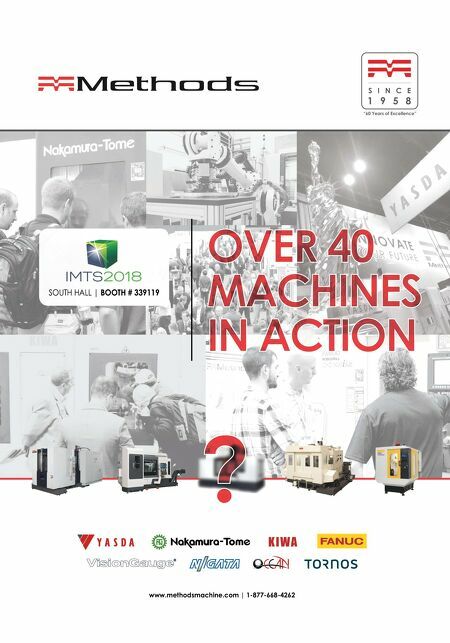 Fast-forward to this coming September at the International Manufacturing Technology Show (IMTS) in Chicago, Illinois, where we will present our Top Shops workshop on Thursday, September 13, in rooms W-375 E and D in the West Hall. Like last year's conference, the workshop will deliver real, applications-based information, and enable you to compare, contrast and consider processes and strategies that might help improve and grow your machining business. We will also present results from our eighth annual Top Shops benchmarking survey, enabling you to see how your key performance metrics measure up to leading U.S. shops. The workshop will feature multiple panel dis- cussions, too. For example, one panel will include a representative from each of the four 2018 Top Shops Honors Program winning shops. This panel will address various practices those successful shops have put into place to become more efficient on the shop f loor as well as the front office in terms of machining technology, shopf loor practices, business strategies and human resources. Another panel from Plethora will address data- driven manufacturing as it is applied at the shop, located in San Francisco, California. Plethora has redesigned what a contract machine shop does and how it operates. Developing its own soft- ware to automate the quoting, scheduling and CAM-programming processes is a key part of this redesign, but there is much more that is radically differ- ent about Plethora's business model. (Learn more about this shop at gbm.media/ plethora .) A third panel will address the skills gap. Although most machine shops face chal- lenges attracting and training new employees, there are programs and tools available to help them. In this panel discussion, industry experts will touch on a few such programs and offer general, helpful advice for shops struggling with workforce-development issues. This workshop is a natural extension of our Top Shops benchmarking program. I encourage you to visit topshopsevent.com to review the entire workshop agenda, and I hope to see you there. HAVE WHAT IT TAKES? Review the 2017 Top Shops data to learn how you can be a Top Shop: gbm.media/ts17 . I encourage you to visit topshopsevent.com to review the entire workshop program.